October 2012 – Teach. Brian. Teach. I’ll be giving a talk to a Physics Department in a few weeks. So far, I’ve only had opportunity to do this once before, and it was around dissertation time. So obviously, I talked about my dissertation work. Now, I’m reaching a point where I think a lot more about how to engage different audiences with PER as a field, rather than just how to showcase my own work. Anyway, here is a draft of the title and abstract for the talk I’ve been working on. Once the talk is done, I’ll come back and post. First day of the moon, I had students interview their partner about what reasons they can give for why the moon is sometimes only partially visible (or even not visible at all)? They were supposed to *not discuss their ideas* but act as a journalist, reporter–asking follow up questions, and taking notes to really get inside that person’s understanding. They then had to report out that person’s ideas to the rest of their group. Students could then discuss and collaborate, and then white-boarded initial models. We then presented as a class. Here are my interpretations of ideas that came up. Version #1 (Moon configuration only): New moon is when moon is behind earth receiving no light. Full moon is when moon is 180 degrees there, now getting the sun’s full light. Phases are when moon is in intermediate locations between behind earth and in front of the earth. Version #2 (Moon configuration plus vantage point): New moon is when moon is behind earth receiving no light from the sun, but a visible moon is anytime the moon is not in the earth’s shadow–what exact phase you see the moon in depends on your vantage point from the earth. For example, this group drew a “full moon” when moon just came out of the shadow. Then, whether you see it as a full moon or another partially lit phase, depends on your location on earth. Version #3 (Visible portion of lit portion): New moon is when moon is behind earth receiving no light, therefore not visible. Solar eclipse is when moon is directly between earth and the sun, because moon is blocking sunlight from getting to earth. First quarter and 3rd quarter, are the result of the moon being at 90 degrees. Half of the moon toward the sun is lit, but only half of that half is visible from earth, making a quarter moon appearance. Crescents are caused when moon is just passing into the back of the earth (partially in the shadow), and this partial blocking effects that you might still only be able to see a part of the part that is visible (i.e., making less than a quarter). Notes from presenting group: Full moon seems impossible to create, and so they are concerned that this mostly wrong. They also worry that their diagram suggests that a solar eclipse would happen all the time, and they know its more rare than that. They are also wondering about what is a lunar eclipse, and how that fits in. New moon is when moon is between earth and sun, because the lit part of the moon is facing the sun, not the earth, making it not visible to us. Full moon is when moon is on backside of the earth, where the lit side is facing the earth. This means that light must still get the moon somehow even when its behind the earth; so either light gets around the earth (due to its spherical nature, not wall-like nature) or the moon-earth-sun must not fall in a perfect line. This group actually began making a whiteboard the same as the group presenting version #1, but as they drew and discussed it they realized many of the same issues that group #3 discussed. As a class, we have very vague ideas about what causes configurations of earth-moon-sun to change–as some combination of earth’s rotation, earth revolution around sun, and moon revolution around earth. People seemed uncommitted and confused about what does what, and even confused about seasonal changes vs. lunar changes. We also have very vague ideas about the path of moon through sky, which is of course related to the confusion above. Tomorrow we dive into our moon observations we’ve been collecting over the last 6 weeks, and working to put all our individual observations into a class-wide set of observations. Then I’m hoping we’ll do some work talking on issues of scale, and then revisiting our theories. 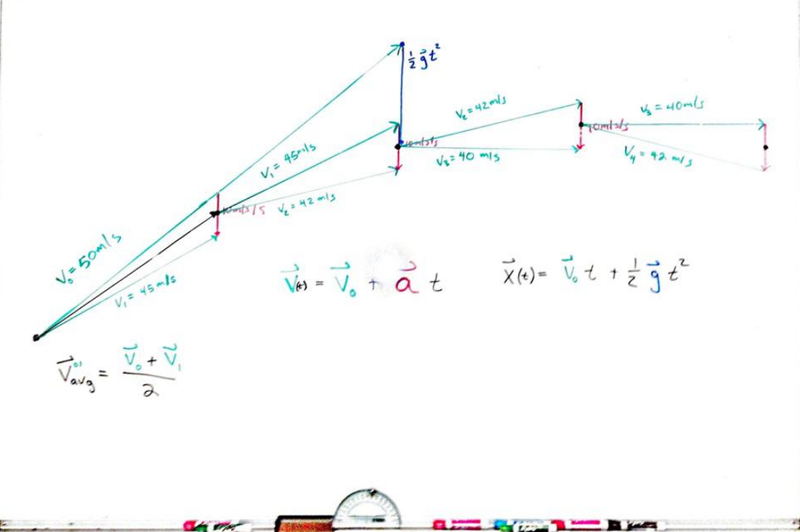 Today, the future physics teachers and I will tackle projectile motion with metersticks and protractors. I’m curious how this will go. Teaching circular motion is just awful. That is, it is awful if you haven’t built a foundation of kinematics rooted in vectors quantities. How can you possibly interpret a centripetal acceleration of 4 m/s/s? What does that 4 mean? When you shine “white” light on non-reflective colored surfaces, the light that comes off carries or takes on the color of those surfaces. That colored light goes off in many directions (not just one). Colors from objects outside get inside box theatre to not only form an image, but a colored image that matches the color of the objects. The color that objects appear to be in sunlight (or artificial light engineered to be similar to sunlight) is what we typically call “the color of an object”. The perceived color of an object can vary from its “natural” color if the light is colored light. When we shined red light on the rainbow fabric, we saw a dark band and a red band. In white light, what was the dark band was now green, blue, and purple. What was the red band was now red, yellow, and orange. When we shined red light on the yellow jacket and the white wall, the perceived color was indistinguishable. Sunlight seems to consist of many different colored light (ROYGBV), and artificial light made to be similar to light is made of many different colored light as well. When an i-phone screen is examined under a microscope, white light is made up of tiny reds, greens, and blues. Does light absorb color from surfaces, or is light absorbed by colored surfaces? What is the ontology of color? Is color a property of objects, a property of light, or both? Or is color just a physiological / psychological response to light entering our eye and our brain interpreting it? Is the color of an object determined by the colors that reflect off it, or determined by the colors that are absorbed into it? Is black all of the colors or the absence of colors? Is white all of the colors or the absence of colors? If surfaces absorb some colors and reflect others, how does the object “know” which ones to reflect and which ones to absorb? What’s the mechanism? How is mixing paint and mixing light similar / different? Is every image (including color images) made of up tiny glowing dots /pixels, even if they are too tiny for us to see? In what ways are sunlight and artificial light similar / different? Why is yellow on the computer screen made up of green and red dots? How does our eye perceive color? What is color-blindness? What does world look like to color blind people? How do animals have night vision? Can they see in pitch dark, or just see well even in really dim light? How does night vision technology work? What are primary colors? Why doesn’t a computer use red, yellow, and blue?